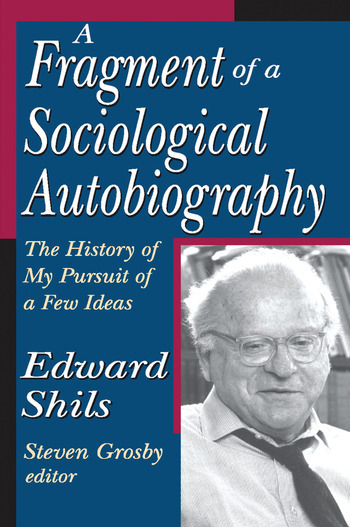 Edward Shils was one of the giants of sociological theory in the period after World War II. In this autobiography, written three years before his death in 1995 and never before published, Shils reflects on the remarkable range of his life's work and activities, including founding and editing the journal Minerva, being a central figure in the Congress of Cultural Freedom, serving as a founding member of the editorial board of The Bulletin of Atomic Scientists, and being a member of the International Council on the Future of the University.Shils recognizes that a unity of concern runs through his many theoretical writings and activities. Early in his life the concern was expressed as understanding the character of consensus. During the last fifteen years of his life, he refined his understanding of consensus through investigation of the nature of "collective self-consciousness." That concern was the structure and character of the moral order of a society, and, in particular, liberal, democratic society. Accompanying the autobiography are two unpublished essays, "Society, Collective Self-Consciousness and Collective Self-Consciousnesses" and "Collective Self-Consciousness and Rational Choice," two areas of intellectual concern discussed in the autobiography. The book contains fascinating discussion of many of the people Shils knew throughout his illustrious career: Robert Park, Louis Wirth, Talcott Parsons, Karl Mannheim, Michael Polanyi, Audrey Richards, Karl Popper, Robert Merton, and many others.The volume represents Shils' final formulations on the character of society and its moral order. As such, it is a most important contribution both to the history of the social sciences in the twentieth century and to sociological theory.